As an orphan ward of the Sisterhood, eighteen-year-old Kalinda is destined for nothing more than a life of seclusion and prayer. Plagued by fevers, she’s an unlikely candidate for even a servant’s position, let alone a courtesan or wife. Her sole dream is to continue living in peace in the Sisterhood’s mountain temple. But a visit from the tyrant Rajah Tarek disrupts Kalinda’s life. Within hours, she is ripped from the comfort of her home, set on a desert trek, and ordered to fight for her place among the rajah’s ninety-nine wives and numerous courtesans. Her only solace comes in the company of her guard, the stoic but kind Captain Deven Naik. I picked this book out from the Kindle Unlimited library and listened to the audio book on my work commute as well as read the e-book when I had the chance. I love the whispersync feature on Amazon so I can switch between reading and listening to audio books depending on how my day is going. The title and cover of the book were really intriguing to me, so I was excited to see how the plot turned out. The world of this book informs much of the plot and I enjoyed learning about the religion, customs and magic of this world. There is a note at the beginning of the book that states the religion is based on another world religion, although there are differences. The rest of the world, though, is a mix of different cultures, but obviously inspired by the Eastern traditions. I enjoyed the change of setting for a fantasy book, but could see how some elements could perpetuate negative stereotypes about Eastern and Middle Eastern religions and cultures. The main character, Kalinda, is a decent narrator and protagonist. She has some interesting secrets, but is overall relatable and easy to follow along with. I truly enjoyed her chemistry with her love interest, although their relationship progresses quickly. However, that “insta-love” trope doesn’t both me too much in fantasy books where the plot is fast paced and full of other conflicts. However, I was often wishing the main character had more friends to rely on, as having every character she meets hate her became predictable after a while. The plot of this book is really the driving force. The story and conflicts hooked me into the book from the first chapter. The obstacles of the book begin piling up quickly and kept me turning the pages the whole way through the book. I also loved the core conflict of Kalinda being chosen to be a wife of the Rajah and having to fight to keep her spot. A few points in the book, I thought there were a few too many subplots, although they all came together by the end of the book. 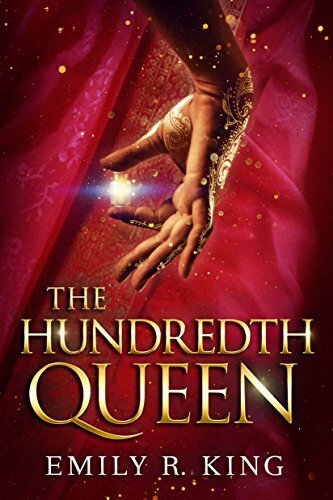 The Hundredth Queen is Emily R. King’s first novel and the first book in her The Hundredth Queen series. There are some problematic elements to the world created in this book and, if you don’t like fast paced love plot lines, you may not like the main character’s relationship with her love interest. However, I loved how fast paced and fun this book was read and it was definitely memorable compared to the other books I’ve read so far this year. The Hundredth Queen is available for free with your Kindle Unlimited subscription.